New Zealand might be as isolated as can be from the international fashion hubs, but the stylists from this enchanted land have their finger right on the pulse of trends and even plant the seeds for new trends to come. 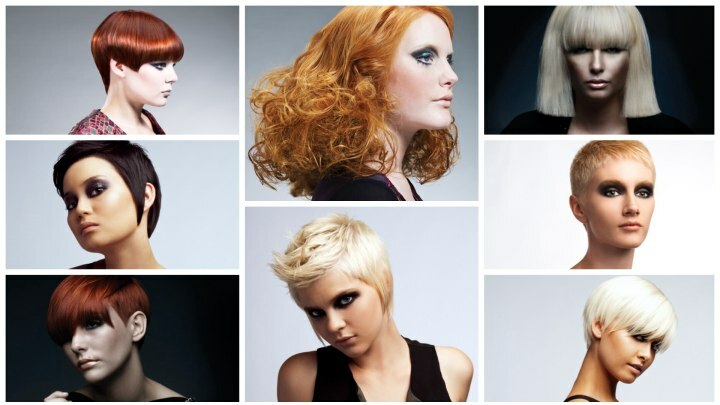 The finalists for New Zealand Hairdresser of the Year show us a collection of hairstyles as diverse and spectacular as the unforgettable landscapes of their home in the very south of the Pacific Ocean. Curls, straights, textures and linear, geometrical cuts gleam in the colors of intense nature in its wildest and purest form. 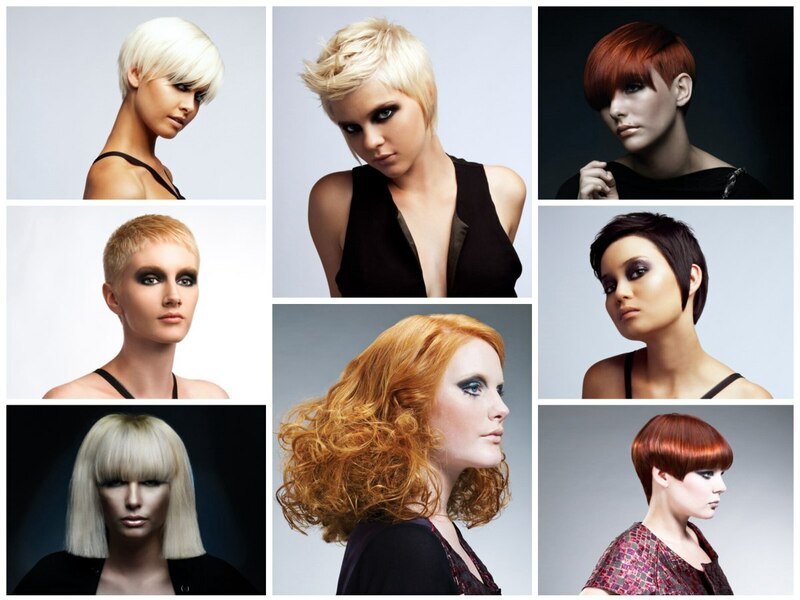 Blondes, reds and black are dominant and rarely mixed. The cuts are strong enough to stand alone without much color play. This short hairstyle was sculpted like a precious piece of jewelry. The haircut is as distinct and precise as the cut of a diamond. It follows the line of the face, curves precisely around the ear and eases to a rounded point in the back. The side and back hair is styled close to pronounce the roundness of the head. On top is where the artistry comes in with the longer crown hair moved gently towards the front and a few strands directed against the flow. Cleopatra gives us a wink with this formidable look. The blunt cut platinum blonde bob shows an almost supernatural straight cutting line, which enhances the volume of the already thick hair. Refined styling techniques bring lift to the roots, especially on the crown and add roundness to the eyelash long fringe. The normally cool hue was gently accented with a more golden, transparent blonde to illuminate festive nights and days. Making a statement is easy and does not require words with a hairstyle as distinct as this short look. To call it sassy is an understatement. It is bold, intense and full of energy that manifests itself in the sharp angles, balancing roundness and a radiant, rusty red color of deep copper. Centered high on the crown the hair revolves around the head in sleek shine and has its attractive highlights in the sharp corners on the sides and a long, pointed neckline. Powerful curls play around the shoulders in high definition. A dramatic appearance is guaranteed with this long curly hair style due to its sheer volume, sophisticated texture and bright, alluring color. This style is romantic but also full of strength and determination. For a special effect and to keep the hair away from the face a narrow strand was almost invisible pinned right above the ear. 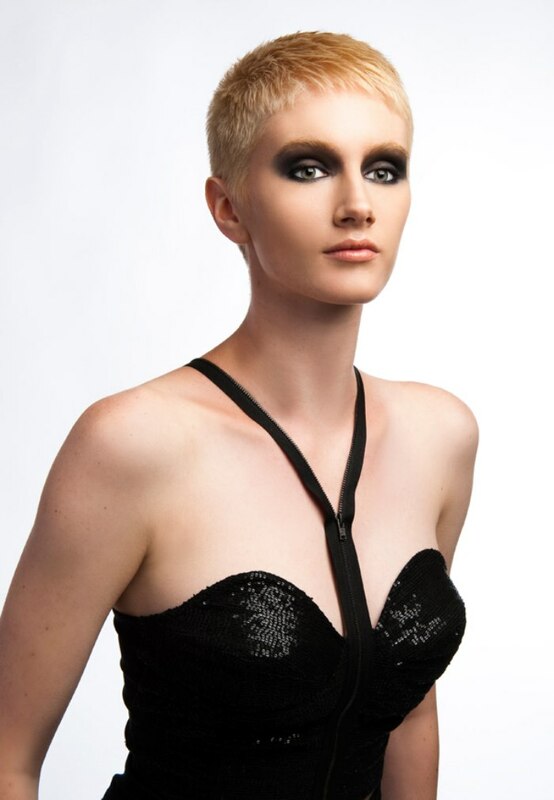 Androgynous can be extremely feminine with the right make-up. The bold eyes however do not totally distract from the fine texture and velvety flow of the short crop. Blonde like the morning sun this look focuses on supporting the roundness of the head with short clipped sides and a slightly longer crown, both connected through the most fluid transition. This style shows off a beautiful face and also cutting skills par excellence. Another look that works with the magic of roundness. 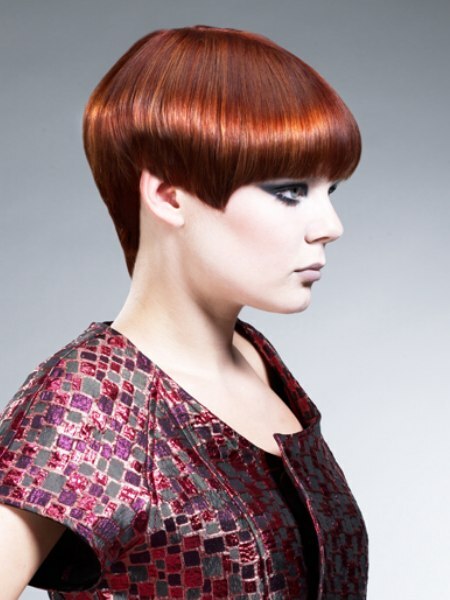 This endearing short style uses feathery textured ends to enhance the lines of the head and the face. The eye-long fringe reaches all the way to the ears on both sides and brings the attention to a soft neckline. Platinum white is perhaps the purest color of all. It speaks the language of sophisticated elegance but also of daring creative freedom. 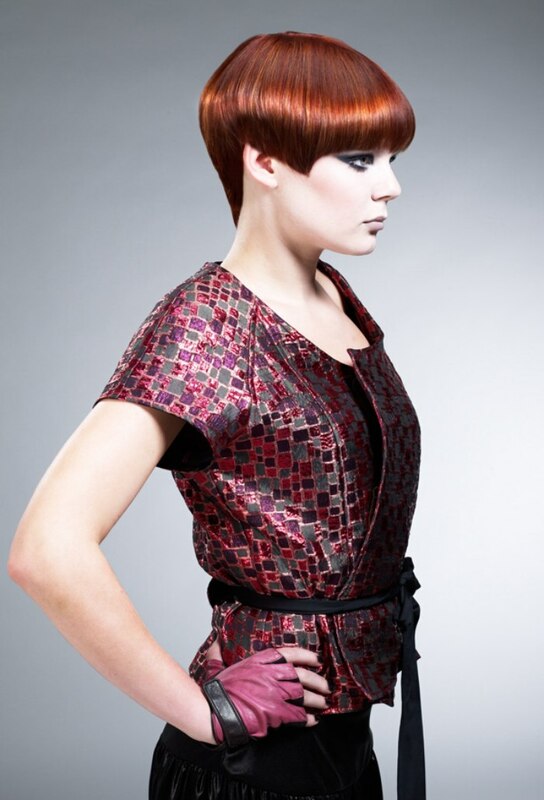 Among all the trendy styles with short sides and a longer top this look stands out with showing just the opposite. The top is textured and styled for movement while the sides are sleeked along the sides of the face all the way to the jaw. Leaving a triangular opening for the ear the hair lengthens again in the back where it forms a rounded but pointed line to enhance the slender line of the neck. Like a little black dress this hairstyle delights with its understated elegance that fits for all situations and occasions. A layered cut with textured tips and graduated lengths, the shortest on the crown, is a versatile basis for innumerable styling options. The hair is tapered along the face and gently touches the jaw before it lengthens just a little more to shape a beautiful back. The top section was worked through with styling products to achieve a textured, spiky quiff that curves upward in the front. The curls of this spicy redhead flow towards and around the face like the ripples of a wild mountain stream. Their energy is as archaic and powerful as the jewelry of this New Zealand sorceress. The length gently increases from the top down and from back to front culminating in a full, frothy fringe. The heat of the coppery hue brings up the temperature even in arctic regions. This princess of the Southern Seas casts her spells with mysterious eyes behind a veil of the two toned fringe. The key element of this rounded, textured and layered chin length hairstyle has a blunt, straight cut underbody in the dark mocha base color of the look. A series of long white-blonde strands extend to almost twice the length and add an elfish, stylish appeal.